After crunching data from a recent trip to New Zealand’s Stormy Pot, its explorers were excited to discover that they had been only 20 meters (65 feet) away from making connection to the 24 kilometer (15 mile) long Nettlebed Cave system. A connection between the systems would result in a cave system nearly 40 kilometers (25 miles) long and about 1,200 meters (3,937 feet) deep, making it the deepest cave in New Zealand, and one of the deepest through trips in the world. The group of 15 cavers, which spent eight exhausting days in the cave, have mapped it to a depth of 700 meters (2,296 feet) and a length of 14 kilometres (8.6 miles) over a number of visits since it’s discovery in 2010. 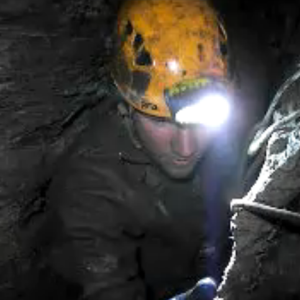 Found while on an expedition to visit the Ellis Basin cave system in Kahurangi National Park, the team opted to take shelter in the “small cave” after their own encampment was destroyed by a storm. Following the cave, the entrance led to a wider, higher system that eventually extended to a length of ~2.5 kilometers (~1.5 miles) and a depth of 470 meters (1542 feet) before the team stopped because they encountered a 10 meter (33 foot) waterfall.